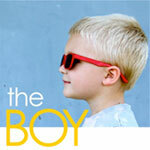 Do you follow the Celebrate the Boy series at Made by Rae and and Dana Made it? It’s an annual event of posts, tutorials, and inspirations for the boys in your life! This year it has started on February 25, 2013 and will last for two weeks. It’s the perfect time around because Sidra is in need of new outfit as he keeps growing. I’ve been quite busy sewing last week and came up with several pieces. 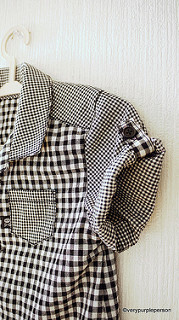 I found several pieces of different sizes checker print fabric, each in 50 cm (half yard) cut and thought that they would be perfect together for Sidra’s shirt. 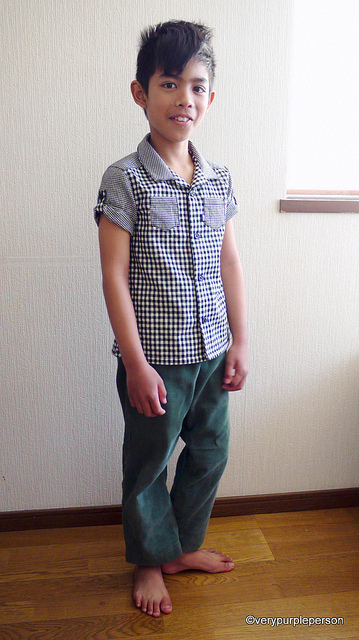 Several years ago, 50 cm is the perfect length for Sidra’s shirt but not this time. 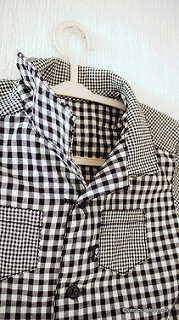 Fortunately the shirt has yoke so the pattern length is juuuust right on the fabric. I was missing a couple mm here and there but they conveniently disappeared into the seam allowance. 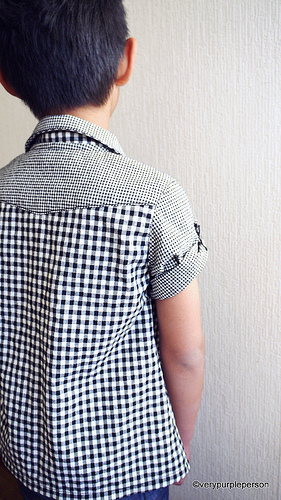 The pattern is #13 from a Japanese pattern book, シンプル&ちょこっとデザイン おんなの子服おとこの子服. 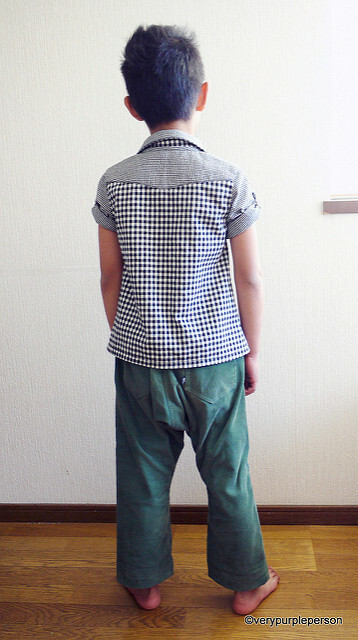 I’ve used the pants (here, here, and here) and sleeveless patterns from this book before and was always happy with the result. 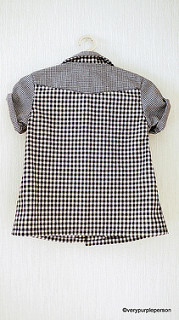 The shirt pattern is also delightfully wonderful with details like the yoke, tiny pockets, and sleeve tabs. 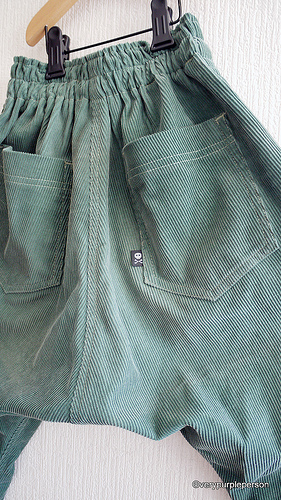 The pants is a sarouel made with green corduroy from my stash. 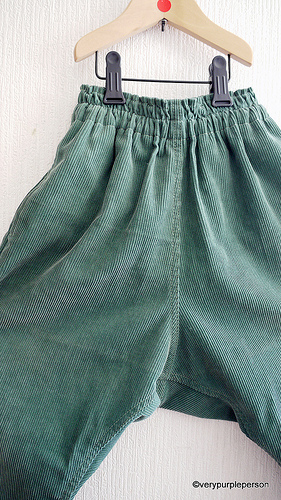 Sidra had been asking me for a sarouel pants lately. 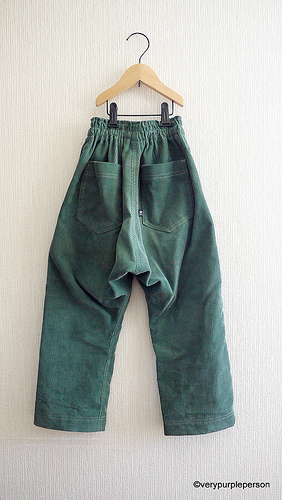 He didn’t know the name of this kind of pants, but he pointed to a picture in a fashion magazine and claimed that he wanted a similar one. I have never really thrilled with this sarouel trend but he’s the customer so I promised to make him a pair. I looked for kid’s sarouel pattern and didn’t found anything. Fortunately all I had to do is just tweeting and several people came up with helpful ideas. 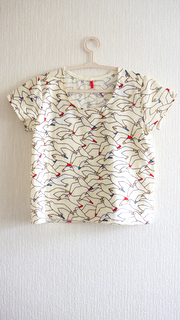 Dear Yoshimi pointed me to the right direction, which is a Japanese pattern shop with the name Full of Patterns. 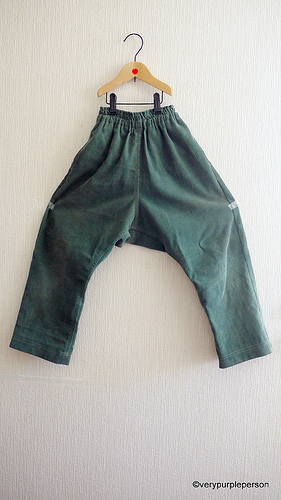 It is all in Japanese, but Google translate power gave me strength to browse and confidently ordered a PDF pattern FOP-K09 for kid’s cropped sarouel pants. 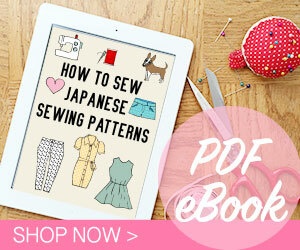 The pattern is very easy to sew and fit. It is a sarouel after all so accurate fitting is not necessary. 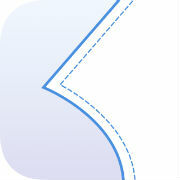 I lengthened the legs a bit and omitted the tab. 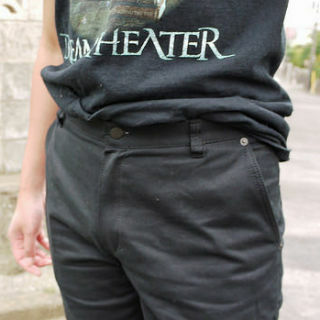 Sidra looooves the pants. He loves the big pockets, the low crotch, and the comfort. He’s been wearing it the whole week to school and everywhere. I can see that it is very comfortable! 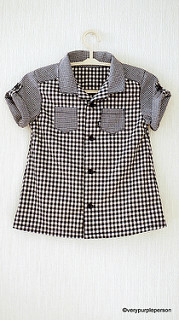 Shirt pattern is #13 from シンプル&ちょこっとデザイン おんなの子服おとこの子服, size 130. 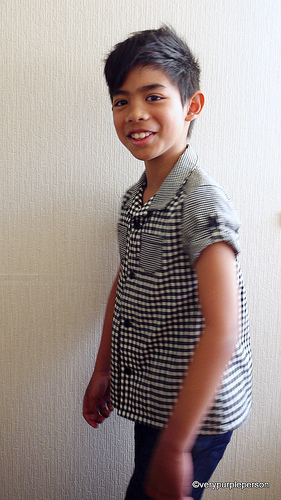 Sarouel pattern is FOP-K09 from Full of Patterns (PDF pattern – Japanese pattern shop), size 130.